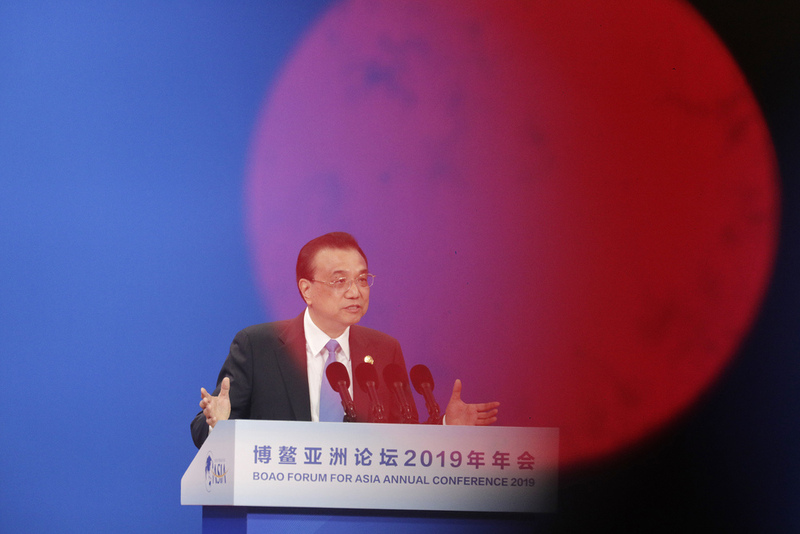 China will sharply expand market access for foreign banks and securities and insurance companies, especially in its financial services sector, Premier Li Keqiang says. Beijing will also work on more favorable policies for foreign investors to trade Chinese bonds, Li told the Boao forum in Hainan. "We are quickening the full opening of market access for foreign investors in banking, securities and insurance sectors," he said. Li's remarks add to speculation China may soon announce new rules allowing foreign banks and insurance firms to increase their presence in the mainland. Beijing has pledged to further open its massive financial markets to foreign investors since last year, amid a simmering trade war with Washington. Foreign firms have long complained liberalization has been too narrow and on-the-ground implementation spotty. Li said the business scope of foreign banks, as well as market access for credit rating companies, bank card settlements and non-bank card payments, will all be "expanded sharply," with restrictions on the scope of foreign securities firms and insurance brokers expected to be removed. Li said China will also announce policies to help foreigners to invest in and trade China's bonds, just before their inclusion in the Bloomberg Barclays Global Aggregate Index from Monday. China has eased foreign access to its US$13 trillion (HK$101.4 trillion) bond market in recent years, especially through the Hong Kong Bond Connect scheme. Li added China will issue "more favorable" rules for foreign acquisitions of Chinese listed firms. Li sought to ease investors' concerns over China's cooling economy, saying Beijing has enough policy tools to fight a "hard battle." But Chinese policymakers have stressed that Beijing would not resort to "flood-like" stimulus that would unleash huge amounts of cheap credit, out of concern that could add to a mountain of debt. China's economic growth cooled to 6.6 percent last year, the slowest pace in nearly 30 years, and analysts expect a further pullback to 6.3 percent this year.